flexible spine AND adjustable pelvis! Highly detailed, life-size model shows all significant features for each vertebra, including vertebral body, spinous and transverse processes, vertebral notch and spinal canal. Features complete pelvis, sacrum, occipital bone, vertebral artery and nerve branches. Herniated disc between the 3rd and 4th lumbar vertebrae. Ideal teaching model for students, for patient education by chiropractors, orthopedic surgeons and other medical professionals, and for company health programs on lifting and bending. 2-part stand included. Size: Spine 29" tall, stand 34 1/2". 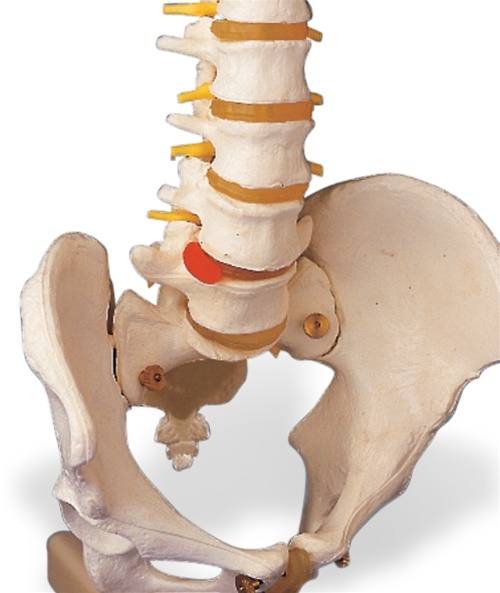 The flexible spine model with stand was ordered to be used as a demonstrative exhibit during a recent trial involving disc herniation and spinal injections. It was proportionate to the spine of a live person and so I was able to show the jury the exactness of where my client was injured and the location and procedure used for receiving lumbar epidural spinal injections. I would recommend this product to other attorneys. Overall a pretty good product. The quality isn't perfect as I have seen better models on the market (hence 4 stars). As far as value goes, it was inexpensive and gets the job done accurately. Great from a student aspect on a limited budget. I am not disappointed in the purchase, recommended this product and subsequent customers are satisfied as well. The product appears to be of solid manufacture and I can easily see myself keeping this through my education and into my private practice.What I would like from the model:1) Less apparent molding seems from the fabrication process.2) Catalog pictures show white model. Mine is definitely not white, but off-white bordering on yellow.3) I'd like to be able to easily disassemble it to view individual vertebrae characteristics so I don't have to buy a string of vertebrae.4) The upper boot SI joint is relatively immobile. I'd like to demonstrate SI joint movement more easily. The joint itself has a plastic protrusion that limits the joint movement even if you loosen the joint screws.I'm not disappointed with my purchase. I use this to demonstrate how the spine moves and how nerves can become irritated due to misaligments. My wife said I didn't have a backbone... so I bought this one. I hear no more complaints! We purchased these spines as Holiday gifts for our residents and they loved them! My Physician also purchased one for himself. They were a good size and the stand it came with was great and also very practical. Highly recommend product, especially considering the price!